ow would you classify an album of dogs barking Beatles songs? Do Leonard Nimoy’s Star Trek inspired albums belong in Pop Vocal, or is it more complicated than that? And what about all that early stuff on Rhino, don’t they hold up surprisingly well? These are just some of the questions that define the oddball genre loosely defined as Outsider Music. These are the records that fall perfectly outside traditional good taste. Anything obviously silly but also obliviously sincere. Despite the unusual criteria, some stores excel at stocking this unique genre. A great example of this is Atomic Records in Burbank. Burbank has always been a little extra kitschy, and this store is no exception. The walls are decorated with framed B-movie posters, hung above nearly every subgenre of jazz you can imagine. The store also has a section called “Personality, Strange, Weird! !” that goes two rows deep! It usually has a couple Mrs. Miller records, and lots of stuff by celebrities ranging from Barbi Benton to Sissy Spacek. The best part is, their prices are always reasonable, if not downright cheap. When I was there researching this article I picked up a very cool Leonard Nimoy double album and a Chipmunks knock off album called Shirley, Squirrely, and Melvin Live that will definitely go over well next DJ Night. They also had William Shatner’s The Transformed Man on the wall as well as some cool Horror stuff. They don’t have a new arrivals section so new things pop up in every section all the time. One of the quirkiest new stores in town is The Record Hunter in Highland Park. It doesn’t have a sign, shares space with a vintage clothing store, and is meticulously curated. Not only do they have a Personalities section, but also ones dedicated to Outer Space, The Occult, Private Press, and other obscure stuff. Some of the Satanic records in the Occult section are pricey, but man are they intriguing. They also carry a lot of great rock records, sub-divided into specific genres I rarely see at other stores like Power-Pop. The organization is unorthodox, but it looks a lot like my record collection at home. Blue Bag is another good store that just opened up in Echo Park. Maybe since it’s new it hasn’t been picked over yet, but the sharp record collector can really score big there. They specialize in Reggae and Dub, but there are plenty of other cool things too. When I was checking the “T” Rock section for Thin Lizzy, I was stunned to find four different Tiny Tim albums, including his masterpiece God Bless Tiny Tim and children’s record I had never seen before. I also grabbed the aforementioned William Shatner record for an insane $15. The staff was really nice too, not the stereotypical uptight record store nerd at all. When I checking out the guy behind the counter asked what records I had put back. When I explained who Tiny Tim was he promptly retrieved the vinyl from the bin and put it on the store’s sound system. Far out! If you’re ever on the Westside, a must-stop is Record Surplus, and not just because it’s one of the only record stores west of Hollywood. I’ve been going there my entire life so maybe I’m a little biased, but it’s the first place I ever remember seeing a specific section for Personalities. The last time I was there it was filled with countless albums from sitcom stars of the 60’s and 70’s. The familiar faces of Laverne and Shirley, The Odd Couple, and Andy Griffith were all there. They even had two copies of child star Jack Wild’s album. Their famous dollar section even has a space for Personality records, which is good if you’re curious about John Travolta’s musical output. No survey of Los Angeles’ record stores would be complete without an assessment of Amoeba. So much has been about Amoeba over the years. Some people dig the wide selection but others miss the personal touch of stores like Aaron’s in Hollywood which, which went out of business when Amoeba opened up down the street. However, Amoeba absolutely has something to offer the Outsider Music collector. First, they stock a lot of brand new reissued vinyl, which is the only place you can find things like Daniel Johnston or Gary Wilson that never got a wide or proper release in their own time. Plus, Song-Poems have their own card in the Oldies section. Another advantage of Amoeba is that since they get so much used stock all the time they sometimes won’t know exactly what they have. I once picked up a Stan Kenton 78 featuring the disturbing music of Robert Graettinger for a mere two dollars. The good records go fast at Amoeba, but there are still deals to be had. Finally, I need to mention a record of newly discovered Outsider music that’s carried at nearly every store in Southern California. It’s called “With Love…From Me To You” by Todd, a shy awkward teenager from 70’s Indiana. The songs are jarringly honest and, in some cases, a flat out cry for help. Since such few people heard it, the songs have a voyeuristic quality, like flipping through the pages of his diary. One of the employees at Rockaway acquired the Private Press record a few years back and posted it on his blog. Todd contacted him and they decided to reissue it. If you see it grab it because it’s sure to go down as a classic. Collecting Outsider Music is fun, especially if you’re into obscure popular culture or real eccentric characters. It’s also a great way to build a unique collection, particularly if things like pressing and condition aren’t that important to you. All the stores I mentioned understand this, but there’s no reason to stop hunting there. Every record store is worth a visit. Now I can put a name to it, “Outsider Music.” It’s perfect. Thanks for an insightful and more-than-interesting article about this music genre I’ve seen all my life. It’s just a brand extension, really, and a cool one at that. I like seeing an unexpected face on an album cover: an athlete, an actor, a politician. My brother has collected authentic, outrageous names his entire adult life. These kinds of outsider categories make for a more interesting world and, just like these albums, great conversation starters. Great article, and very informative. 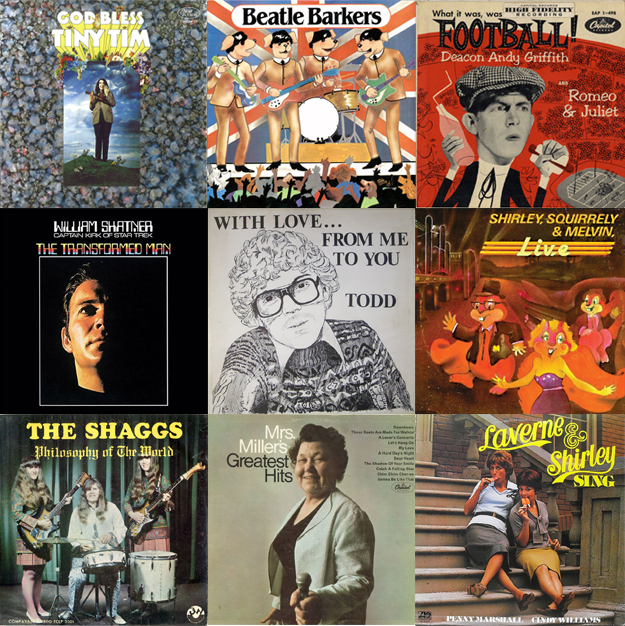 I have a few “Outsider Music” albums in my collection. I feel it’s a very underappreciated genre, but I hear alot of humor in these albums, that’s my attraction to them. Also, great record stores mentioned, I get to frequent some of these as I work in Echo Park. Looking forward to the next article, cheers!!! !